Welcome to the first regular feature on my blog, Big Shot Sundays. I love the Big Shot, it was one of the first items I bought when I became a demonstrator and I use it a lot. I’m really looking forward to sharing some of the beautiful items you can make with this tool each week. I’m not really a girly girl but I do have a soft spot for some things and fairies is one of them (not the Disney type more the Flower Fairy type by Cicely Mary Barker), so when the new In Colours were announced Sweet Sugarplum instantly made me think of fairies and parties and I thought the Curvy Keepsake Box would make some lovely favours. I cut and assembled the boxes (keeping them flat) before stamping the “fairy dust” from Celebrate Today in Sweet Sugarplum on all four sides. The butterfly from Grateful Bunch was stamped in Crumb Cake on the handle sides of the box and I highlighted the stars and butterfly wings with some clear Wink of Stella to give it some sparkle. The little tags were made using the Acorn Builder Punch and Acorny Thank You and the thank you is from Circle of Spring. The acorn caps were Wink of Stella’d (you can never have too much shimmer) and were mounted onto a small gold foil doily and tied onto the boxes using white baker’s twine. These boxes might be small (6.4 x 7 x 6.4 cm) but you can fit loads of goodies in them. Besides sweets they can hold jewellery, hair accessories, little craft kits, small toys (quite a bit of Lego), little stationery items and these are just a few ideas. If you’d like to see more ideas using the Curvy Keepsake Box framelits please visit my pinterest page, I’ve pinned just a handful of the wonderful ideas out there using this gorgeous box. Would you like to have your own copy of the new Stampin’ Up! Annual Catalogue 2016 -2017? I’d love to send one to you and have a couple of offers available from now until June 30th inclusive. 1. Anyone who places an order $50AUD or more (before shipping) will receive a free copy of the Stampin’ Up annual catalogue from me. b) Please check the “Yes” box, next to allow my demonstrator to contact me in your profile, if you select “No” I will not receive any information about you and won’t be able to send you a free catalogue. The catalogue will be sent separately from your order as it is an offer from me personally. Limit of one free catalogue per customer. 2. To purchase a catalogue for $7.00AUD (shipping included), please fill out the contact form and request a copy of the catalogue in the message box and I will send you an invoice through PayPal. (You do not need a PayPal account to use PayPal, any credit or debit Visa/MasterCard can be used, simply follow the prompts on the PayPal website). Once your payment has been approved I will post your catalogue. This catalogue will not come from Stampin’ Up as it is an offer from me personally. Limit of one catalogue per customer. If you already have a Stampin’ Up! demonstrator you regularly order through, please contact them for an annual catalogue. 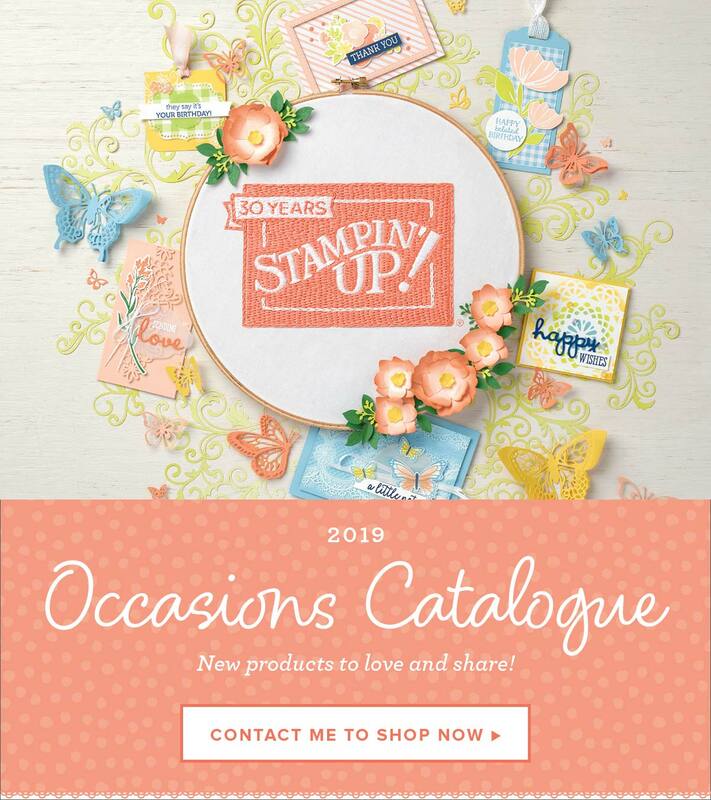 Next Post The new Stampin’ Up Catalogue is here!